Science education and outreach are cornerstones for addressing the environmental challenges that our society faces. 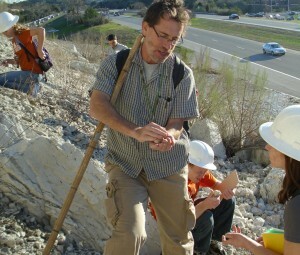 Among our new and continuing education and outreach initiatives are the flourishing Bachelor of Science Degree in Environmental Science (EVS), for which we are now beginning to see a strong cadre of alumni working in environmental consulting, government agencies, or continuing their education at leading graduate school programs. The newly christened Scientist in Residence program, which partners graduate students in science and engineering with K-12 teachers, has seen a remarkable growth of the volunteer component of the program. The popular free public lectures of Hot Science – Cool Talks has been analyzed by a team of communication researchers who have found these events inspire attendees to think more about different science topics, increase their scientific knowledge, and become more aware of science research at the university. The results of this study can be found in the International Journal of Science Education. Our newest outreach program is the recently established ¡Ciencias! program, which brings the excitement of Hot Science – Cool Talks to Austin’s Hispanic community. ESI held two productive meetings this year with our Advisory Council, a group of dedicated members of the public and private sectors. The group is led by Mr. Brian Flynn, a leading environmental consultant and past president of the American Association of Environmental Engineers and Scientists. The council continues to meet the goals of its Challenge Grant and to connect ESI with new partners in industry and the non-profit sector. Texas faces some major challenges in the 21st Century, driven by the projections of a changing availability of water and a doubling of our population by 2065. These challenges are outlined in an op-ed piece in Texas CEO magazine. To best address these challenges, we need to integrate the wide and deep expertise of researchers who study Texas water. Toward this end, ESI has recently launched the development of a Texas Water Research Coordination network, via a workshop of nearly 30 researchers from institutions in Austin, Houston, Lubbock, San Antonio, College Station, El Paso, San Marcos, and Brownsville. Feedback from the group indicated a successful beginning, good agreement on research and outreach directions, and a strong consensus toward continuing the effort. Also, if you are reading this, you have entered the ESI web site — we recently re-designed our web site to not only be more interesting, as there is always a fascinating tidbit to be found here, but to also include new features and content to keep you up to date with the latest environmental news as well as making the site easier to read from your phones and other hand-helds. Please keep in touch with us through this website, or contact us directly at esi@esi.utexas.edu or by phone at (512) 471-5847.